GRACO ST MAX™ II 595, ST MAX™ II 495, ST MAX™ 395 - Start-up Range of Sprayers for Professional Painting Contractors. For professionals who need high output for daily use on residential jobs. The kit can be used in construction or repair of buildings and facilities, painting of buildings from inside and outside, metal constructions. The pump works with any type of facade paints, latex, facades, enamels, primers, polyurethane or water based paints. The system delivers high performance, high coating quality, low paint consumption, up to 60 % economy versus cartridge, working with any type of viscosity and minimal flow ripple. The set offers exceptional mobility due to its small size and trolley options and easy settings for operation and cleaning. Self-cleaning nozzles provide less cleaning time and expense for thinner. The motors are single-phase 220 V, "brush type". Each set is equipped with Smart Control for adjusting and measuring paint flow or outlet pressure and automatic stop of the system in the absence of paint. 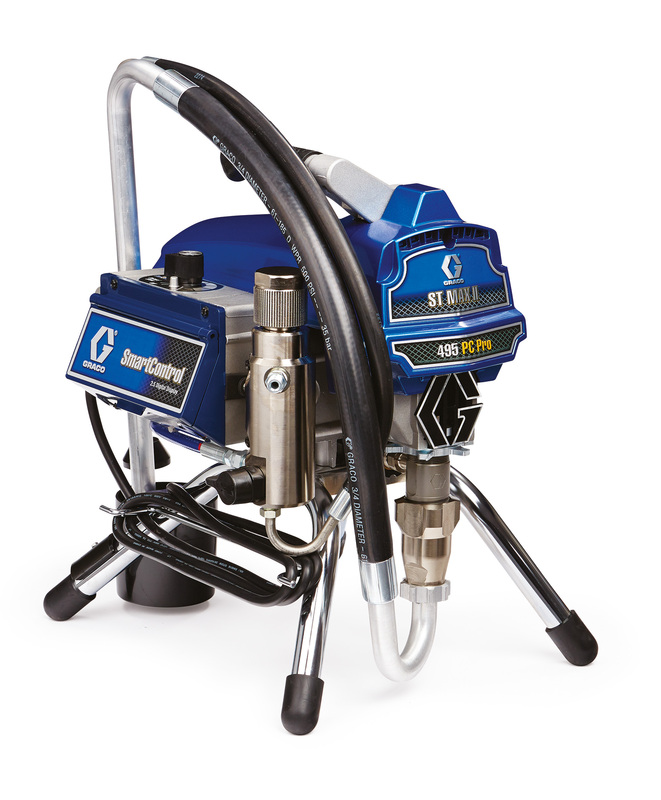 The kit includes a single-phase, single-phase, piston-type or trolley pump, a 15-meter high pressure hose, a 0.019 " reversible type spray gun. Max. Tip Size - 1 gun 0,023" 0,025" 0,025" 0,025" 0,027"